It could also be called the Rosendahl Loop, since this knot is just the loop form of the Zeppelin Bend or Rosendahl Bend. Once the "b" and "q" method of the corresponding bend is mastered, this approximation of the method should be within the grasp of most tyers. This loop shares many of the properties of the Zeppelin Bend, including impressive security, ease of adjustment, and nearly identical jam resistance perfection. It is also stable with unusual loading configurations. Merely repeat the final tuck to obtain the Double Zeppelin Loop. 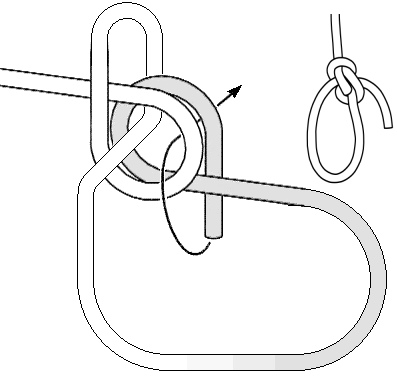 Step 1: Tie a thumb knot (overhand knot). Step 2: With the end of the rope, follow the standing part (yellow arrow) down through the small upper part of the thumb knot as shown. Step 3: Bring the end of the rope forward and then follow the other leg of the loop (yellow arrow) up through the small lower part of the knot as shown to complete the mating overhand knot. Summary of Steps: Overhand Knot. Follow Down. Follow Up. Tip: Don't let the handedness of the thumb knot you tie for step 1 confuse you if it doesn't match the diagram. Just remember that when I say "down" in step 2, I mean down toward the bottom of the loop and down into the page. And, likewise, when I say "up" in step 3, I mean up away from the bottom of the loop and up out of the page. Just make sure the parts of rope you follow do the same.